Room 201 is a Large 2nd Story, 1 Bedroom Apartment with 2 Double Beds and 2 Full Size Sofas. This recently updated large 1 bedroom, 1 bath, condo is located on the 2nd floor and has a large and airy living space. It has been affectionately nick-named "The Penthouse". Ocean views are offered from a full size 6 chair dining table. 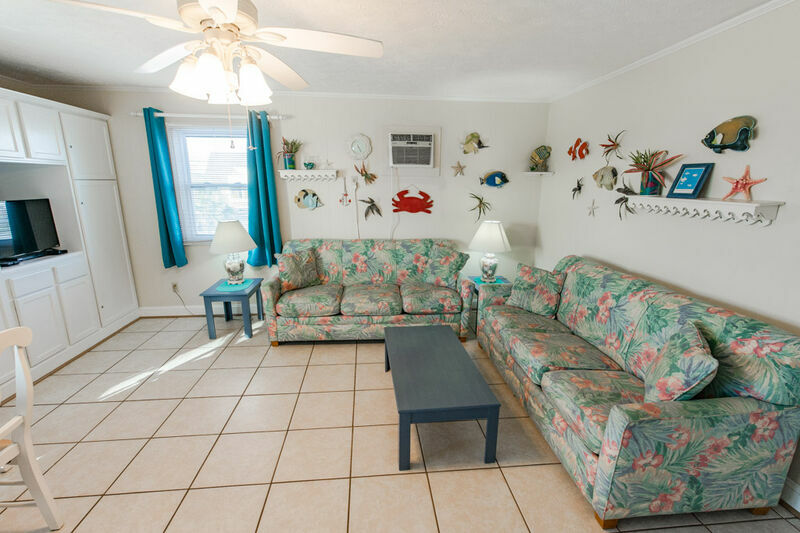 This beach theme decorated unit, over looks the pool with some of the best views of the ocean and Island that the Continental has to offer. The I bedroom has 2 full sized beds with ample closet, and shortage space. The bathroom has a full sized tub with shower. The kitchen features refrigerator, stove, microwave, coffee maker, and toaster oven. 2 full sized sofas and 6 chair dining set in living area offer comfortable space to enjoy family and friends. Tile floors throughout. Non-smoking.